HI 99121 kit has been designed to address the question of correct and rapid measurement of pH directly in soil. 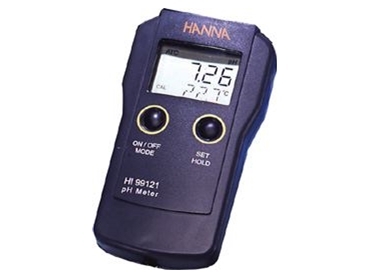 From Hanna , the HI 99121 kit has been designed to address the question of correct and rapid measurement of pH directly in soil. Every item in this kit has been made to facilitate measurements in the field without compromising accuracy. With HI 99121 you can test the pH of soil directly or after preparation of a diluted sample. In order to measure the pH directly, the kit includes a plastic auger to perforate the ground. The HI 1292D pH electrode has been designed for direct soil measurement. It has a conic, rugged tip and can be directly inserted in moist or soft soil. The electrode incorporates a temperature sensor right near the tip to enable it to measure and compensate for the temperature quickly. For higher degrees of accuracy, or for stony ground where the electrode may be damaged, use the specially made HI 7051M soil preparation solution. This solution is included in the package to help you measure pH more precisely by diluting a sample of the soil in it. The dual-level LCD shows the pH value from -2 to 16 with 0.01 resolution. It also displays the temperature on the secondary level at the same time. With a menu-driven custom microprocessor, the user is helped with clear prompts during operation and calibration. HI 99121 is supplied complete with HI 1292D rugged carrying case pH electrode, ground auger, HI 7051M soil preparation solution, pH 4 and pH 7 buffer sachets, HI 700663 and HI 700664 electrode cleaning solutions, batteries, rugged carrying case and instructions.